Fairwheel Bikes of Tuscon has created a 6lb racing bike that is currently on show at Interbike. The bike manufacturer ignored all the uCI rules that govern the weight of racing bikes and decided to take things to the extreme. Weighing just 6lb the bike weighs nearly half that of a Tour de France race bike. 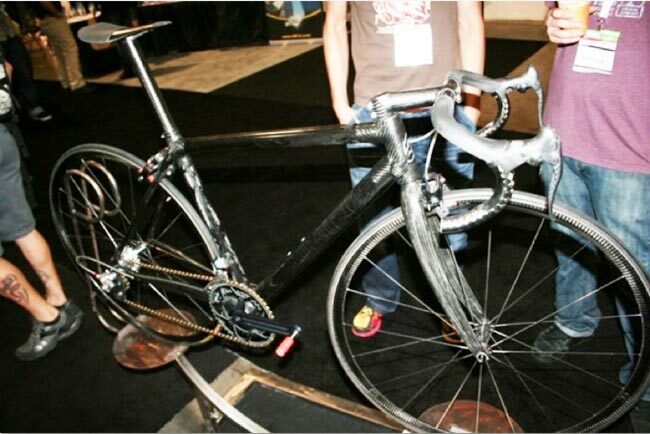 Nearly everything on the bike is made from carbon fiber and some of the components are ridiculously light. Such as the brakes are AX Lightness (130-145 grams the set, depending on model) and the crankset, iuncluding bearings, is juts 281 grams. Even the already light pedals have been drilled down to save weight. The SPIN Custom frame was built by Marc Siebert and even though its a concept bike it has clocked up more than 20,000 miles already with its current owner. With all the weigh reduction its a shame a ride then has to undo all your great work, as if tey were to drink just 3 ltrs of water this would weight more than the whole bike.